The main objective of the project is to develop optimized mining and processing technologies of ion-adsorption clays to recover rare earth elements (REE). The scope of this work is divided into several work packages. The workflow of these tasks is outlined below. Geotechnical channeling of REE-rich ion-adsorption clay deposits by enhancing their permeability for a more efficient leaching process. The permeability of ion-adsorption clay soil profiles can be improved geotechnically by using cryotechnology using liquefied CO2 or N2. (Micro)Biolological processes may replace the traditionally applied leaching methods (e.g. 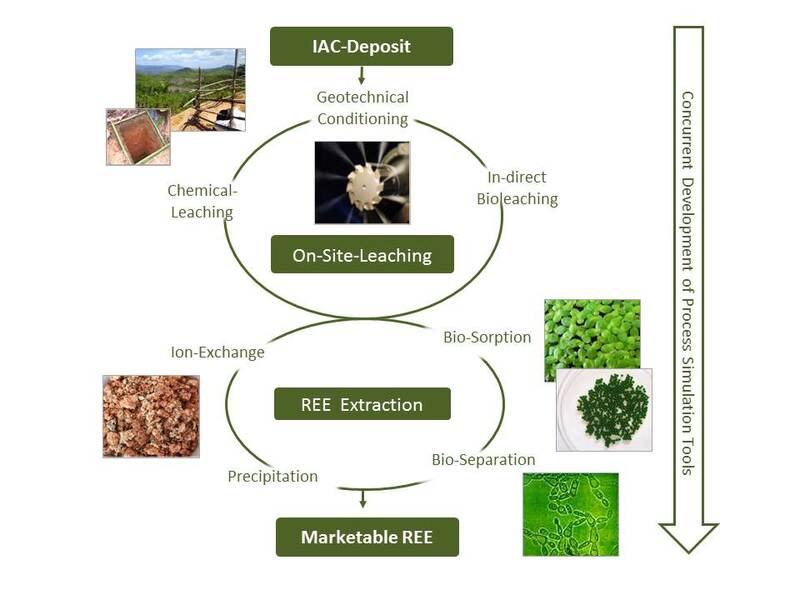 ammonium sulfate leaching) and enable a more environmentally friendly extraction of REE. Numerical process simulation allows the chemical and biochemical optimization of the REE extraction and processing steps.